a twitter revolution? a wikileaks revolution? or a tunisian revolution? | What's that you said? a twitter revolution? a wikileaks revolution? or a tunisian revolution? In due course, every city of consequence in Tunisia will have a street or square named after Mohamed Bouazizi, the unemployed fruit-seller whose humiliation at the hands of the authorities led to a revolution. It’s sad that he didn’t live to see it but today’s events are a fitting tribute. One of the U.S. government cables released by WikiLeaks (via @spbaines) exposed the corruption of Tunisia’s President’s family, its reach into business in the country, and ability to transcend the rule of law. President Ben Ali’s family was called “The Family” throughout the leak. The government attempted to block access to WikiLeaks earlier this month. Whether it’s cash, services, land, property, or yes, even your yacht, President Ben Ali’s family is rumored to covet it and reportedly gets what it wants. It goes on to list quite a few more things and concludes, “So, while unemployment and inflation were the underlying causes of the revolution, this WikiLeak may have been the spark that turned the public, and the government, against itself.” But I think that’s a premature conclusion. 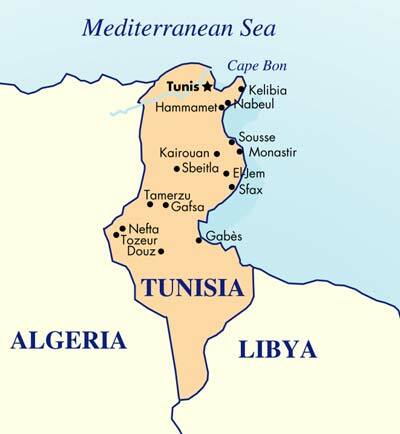 In examining what was going on in Tunisia (for example look here The revolt shaking Tunisia), several things become quite clear. The Tunisians knew exactly what was going on with their government. The situation was becoming more and more untenable over the years. The real spark — literal in this case — I would say was Mohamed Bouazizi. Something that has been lost in this discussion is the recognition of how extraordinary it is for the U.S. government to have taken a neutral position when a friendly autocratic Arab government comes up against enormous popular opposition. It would have been unsurprising if American officials had supported Ben Ali’s regime and called for calm. In other circumstances in countries where the U.S. has more perceived security interests at stake, our Secretary of State might have gone so far as the French Foreign Minister did earlier this week to offer assistance in restoring order. Although I suppose even though the now-deposed President was US-friendly, the stake we had in the country wasn’t that much. Still I think it comes across much better that we didn’t attempt to interfere. That, as the article says, also has the effect of legitimizing the protest that much more in the eyes of the country’s neighbors. The U.S. has a long and sorry history of propping up the wrong people in these sorts of things — the Shah of Iran being only a relatively recent example. It’s past time we stopped doing that. Earlier today, after thousands of protesters surrounded the Interior Ministry and battled security forces in the streets, Ben Ali announced that he had dissolved the government and would hold elections in six months. Then there were rumblings that there would be an announcement on state television, and many assumed that Ben Ali was going to make another speech. Instead, Ghannouchi, a colorless functionary in his late 60s, showed up, surrounded by two other senior officials, and made his surprising announcement. This may not solve the crisis. Ghannouchi is not necessarily any more popular than Ben Ali, though he’s not nearly as tainted by the lurid tales of corruption and excess that so damaged the ruling family. But Tunisians certainly don’t respect the prime minister; they call him “Mr. Oui Oui” because he’s always saying yes to Ben Ali. It’s still an orderly change of control, and as things develop further, hopefully it will stay that way until a satisfactory arrangement is made (ie, without further blood in the streets). More here, from NYT: Prime Minister Claims Power in Tunisia as President Flees. The prime minister’s announcement followed an extraordinary and fast-moving back-and-forth between the government and the protesters, who became increasingly emboldened over the last month of demonstrations. After the president tried to placate the protesters Thursday with promises of more freedom, including a right to demonstrate, tens of thousands rushed into the streets of downtown Tunis Friday to take advantage of his pledge by calling for his ouster. 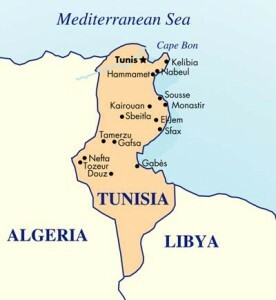 […]Tunisia is far different from most of its neighboring Arab countries. There is little Islamist fervor in the country. It has a large middle class, and under Mr. Ben Ali, it has invested heavily in education. Not only are women not required to cover their heads, they enjoy a spectrum of civil rights, including free contraception, that is well beyond that in most countries in the region. The educational investment has been a mixed blessing for the government, however, producing a generation of college educated young people who face bleak job prospects in Tunisia’s corruption-clogged economy. The anti-government protests began a month ago when a college-educated street vendor burned himself to death in protest of his dismal prospects. But the mounting protests quickly evolved from demands for more jobs to demands for political reforms, focusing mainly on the perceived corruption of the government and the self-enrichment of the ruling family. The protests were accelerated by the heavy use of social-media web sites like Facebook and Twitter by young people, who used the Internet to call for demonstrations and to circulate videos of each successive clash. The corruption, the bribes – we simply want to leave. We begin to apply to study in France, or Canada. It is cowardice, and we know it. Leaving the country to “the rest of them”. We go to France and forget, then come back for the holidays. Tunisia? It is the beaches of Sousse and Hammamet, the nightclubs and restaurants. A giant ClubMed. And for the first time, we see the opportunity to rebel, to take revenge on the “royal” family who has taken everything, to overturn the established order that has accompanied our youth. An educated youth, which is tired and ready to sacrifice all the symbols of the former autocratic Tunisia with a new revolution: the Jasmin Revolution – the true one. It’s fascinating to see his description of schoolchildren furtively sharing proxy servers to get around the country’s censored Internet. A timeline: Tunisian Government Dissolved: First Reactions. The report includes tweets and other material as they occurred. One of the things I am inevitably reminded of is the student uprising in China that culminated in Tienanmen Square. At that time, I recall that a certain amount of information slipped through on the (infant at the time) Internet, but the real source was via fax lines which were ubiquitous and not quite as easily monitored by authorities. Information and pictures were smuggled out to sympathizers outside China and then distributed to the rest of the world. In truth, I don’t think that twitter or Wikileaks “sparked” anything in Tunisia. The events there would very likely have occurred anyway. The people there were — and are — under incredible pressure. What twitter and Wikileaks did was bring our attention to Tunisia — put us in place to witness the sordidness of Tunisia’s government and the current process of its revolution. The information is flowing, not from the West to Tunisia: but the other way around, from Tunisia to us. This entry was posted in news and tagged tunisia, wikileaks. Bookmark the permalink.